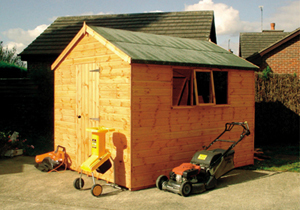 We offer a range of attractive, multi functional wooden workshops and utility buildings designed for the serious (or trainee) DIY'er, gardening enthusiast or contemplator, as well as a timber garage in which to house your "pride and joy". Opening windows along the front panel make the interior bright and airy and at 1790 mm (6') at the front the building is high enough for all but the tallest people to work in comfort - and for the tallest people the roof may be reversed (at no extra cost) putting the 'lower' 1790 mm (6') side at the back and the 2110+ mm (7'+) at the front. The photograph shows 2690 x 1790 mm (9' x 6'). An optional workbench would be the ideal finishing touch. For details on sizes and pricing contact us today. Large and larger. 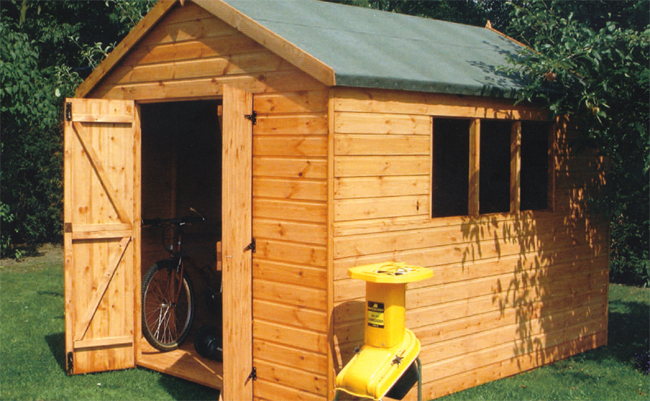 Manufactured using 70 x 45mm (3x2") framework and with a 16mm (5/8") floor on 70 x 45mm (3 x 2") joists, the Bison Workshop is ideal for all manner of working equipment or just for people who like (or need) lets of space to work in. The large fully opening windows make it the perfect working evironment and double doors - 1346mm wide (4' 5") - allow easy access. 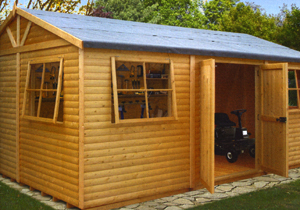 The photo shows 3580 x 2990mm (12' x 10') with an optional workbench. For details on sizes, styles and pricing contact us today. A light and airy, stylish workshop. Manufactured using 70 x 45mm (3 x 2") framework. Also has 16mm (3/4") floor on 70 x 45mm (3 x 2") joists. Supplied as standard with 2 large windows that open fully. 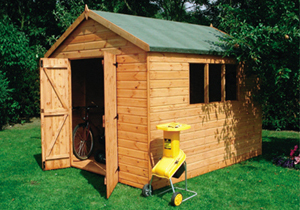 The double doors measure 1805mm (5'11") high and 1420mm (4'8") wide. Loads of space, lots of light - ideal working conditions. Photograph shows 10 x 18 Mammoth, loglap style, with 2 optional windows and optional shelves. 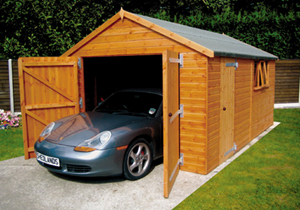 Double doors 4' width available as 2' + 2' or 2'6" + 1'6". 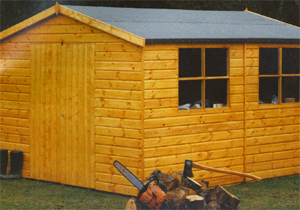 Photo shows 10' x 8' Workshop with 4' double doors split 2'6" + 1'6". 50 x 50 mm framing throughout with diagonal side bracing. Substantial 75 x 50 mm roof truss. 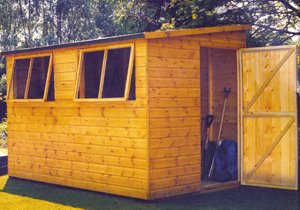 Photo shows Heavy Duty Apex 10' x 8' with 3 pane opening window. 20 x 50 mm framing throughout with diagonal side bracing. Photo shows 16' x 10' with 7' double doors, side access door and joinery 3 pane opening window.